On behalf of the Conjoint Board of Orthopaedic Surgery, I would like to welcome you to Basic Sciences Examination in Orthopaedic Surgery [BSE (Orth)]. This examination is a basic sciences examination designed for doctors in Malaysia who are interested in pursuing orthopaedic surgery as their future career. This examination is initiated and run by the College of Surgeons, Academic of Medicine of Malaysia, in collaboration with the Conjoint Board of Orthopaedic Surgery Malaysia. 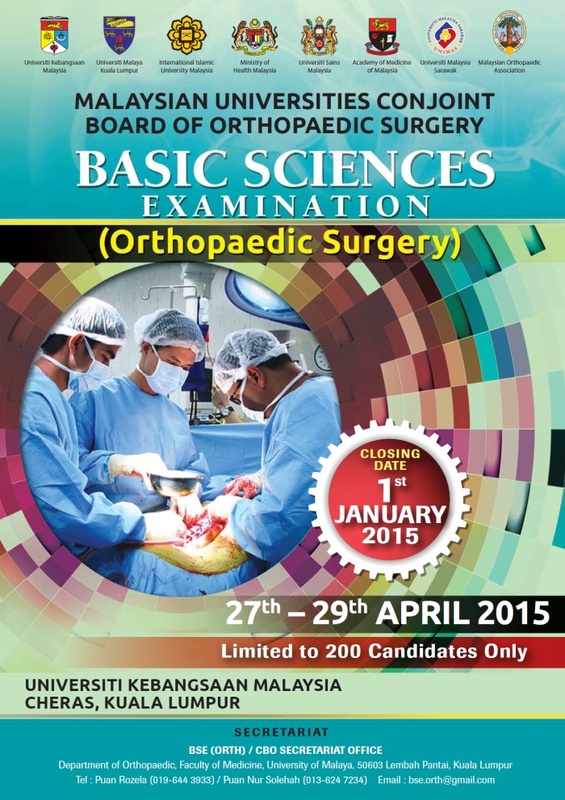 It is a comprehensive examination encompassing all aspects of basic sciences for orthopaedic surgery. Currently, this examination will offer the candidate an edge in the application to our local universities' Master of Orthopaedic Surgery programme. We pledge to make continuous improvements in order to increase the standard of this BSE (Orth) at the highest standard possible, so that it will enable us to foster more talented and quality candidates to join the Orthopaedic training and community in the future. The successful candidate will need to pass all three components, i.e. SAQs, OSCE and VIVA VOCES in order to pass the examination.